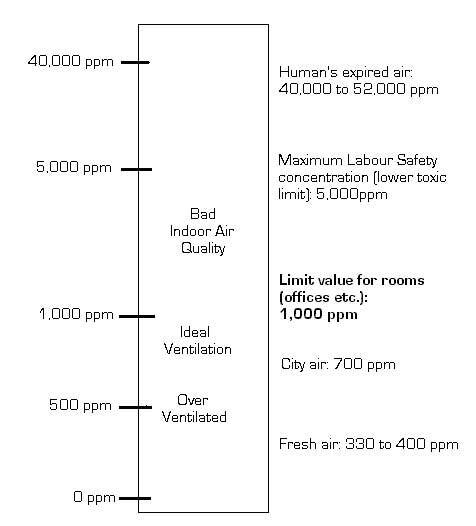 The concentration of carbon dioxide is used as an indicator when assessing indoor air quality. Rooms with poor air quality may result in tiredness and a lack of concentration or even in some cases illness otherwise known as sick building syndrome (SBS). Symptoms include: headaches, eye, nose and throat irritation, itchy skin, nausea, dizziness, fatigue and difficulty concentrating. Poor air quality is usually caused by insufficient ventilation. Normally the CO2 concentration in demand controlled ventilating (DCV) is used to control the fresh air supply. Stationary CO2 transmitters are used and should be checked regularly with a hand-held measuring device. A Capnograph is an instrument which is used to measure the concentration of carbon dioxide (CO2) within an air sample by measuring the absorption of inferred light as it is absorbed particularly well by carbon dioxide. Capnographs are mainly used in medicine to measure the amount of CO2 in inspired and expired air.